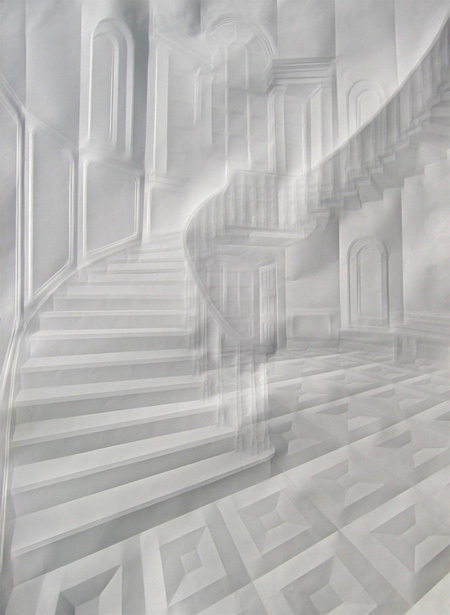 Simon Schubert (1976) is an artist based in Cologne, Germany, his birthplace. From 1997 to 2004, he trained at the Kunstakademie Düsseldorf in the sculpture class of Irmin Kamp. 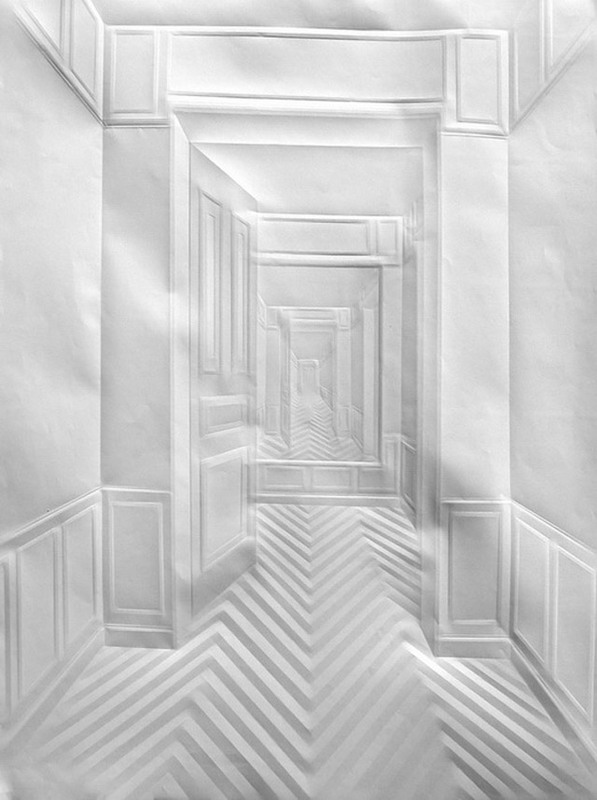 Inspired by Surrealism as well as by Samuel Beckett, Schuberts works imagine architectonical settings, common situations and objects, whereas the material he uses are either simple or sophisticated – white paper folded or mixed media arrangements. Some of his paper foldings entered the West Collection, Oaks, PA, while the Saatchi Collection, London, owns sculptural works in mixed media. FROM YOUR DESKS: How is your table tennis game? 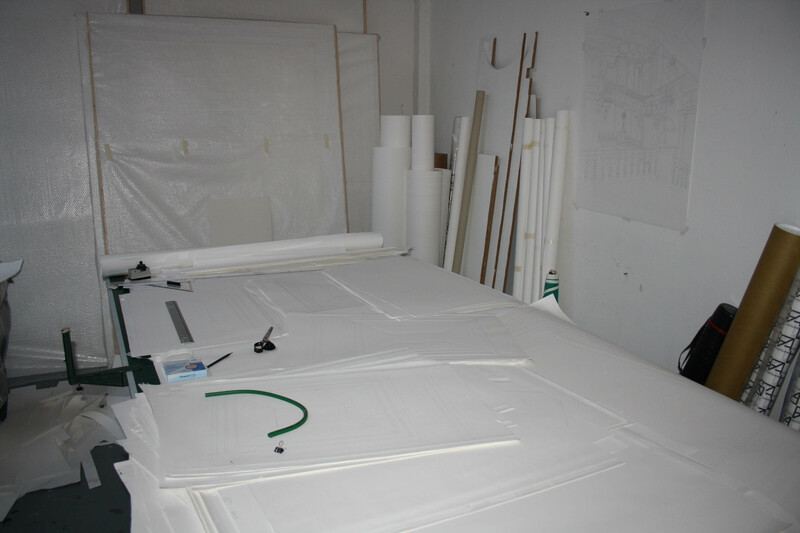 SIMON SCHUBERT: The problem is, that I nearly always prepare large papers for installations or large pictures, so that the board is covered most of the time. That’s why I play very seldom, it takes weeks in between. FYD: What is your favorite time to work and do you keep a routine? SS: My favorite working time is in the morning and in the afternoon, starting short after eight. My children decide or determine my routine. Actually most of the time I work in similar times like a normal worker or employee, but often I also work in the evening and nearly always on the weekend. Behind the doors you´ll find more rooms with more doors, and behind those doors more rooms with more doors. FYD: Can you take us through your process; how do you create and emboss your works? SS: The exact process is some kind of a secret. I make sketches and drawings and construct the images. 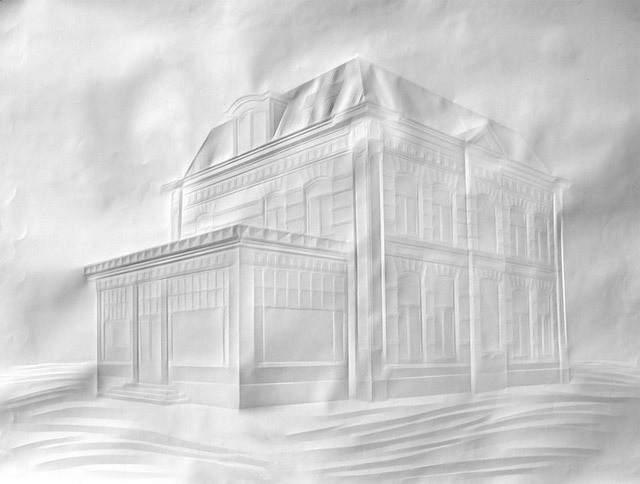 After that I fold the paper with special tools till I think the picture is finished. 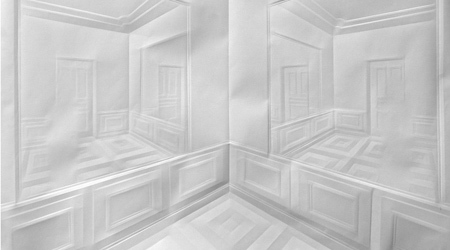 The works are done only by folding the paper and not by embossing. I don´t use any colour or pencil for the shades. FYD: How long does it take to produce each paper piece? SS: Most pictures take about three or four days or sometimes it takes a week. FYD: What is behind those doors? SS: Behind the doors you´ll find more rooms with more doors, and behind those doors more rooms with more doors. 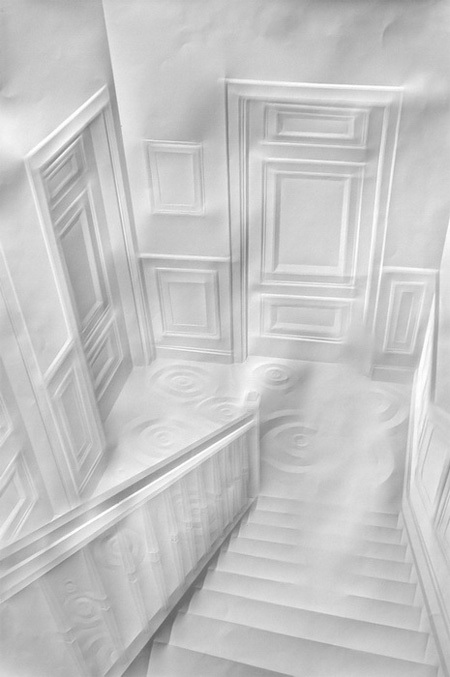 FYD: Do any films or earlier works inspire your work, do you like the world of stark white? I know you visit the darker world too. SS: Films are very important. Lynch, Kubrick, Beckett (videos,film and literature), Hitchcock, Orson Wells. Stark white doesn’t play a role. FYD: Do you employ a certain philosophy? 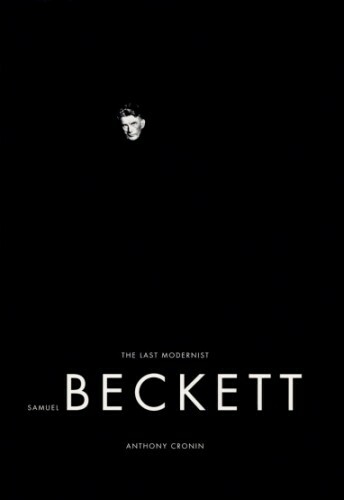 SS: Philosophy by Deleuze, Nietzsche, Bergson are very important for me and literature by Beckett, Kafka, Hofstadter, and many more are most important to me. The exact process is some kind of a secret.